Oh my goodness I am whooped this evening! I am "gotta have a Mike's lemonade" kind of whooped. It's no surprise either, school is going to start in a few weeks. School starting soon is me going on a freaking mad , crazy cleaning and de-cluttering spree. In fact I took out the leaf blower and blew all of the dust and hay from the garage so that I would have a clean space to start piling up all of the stuff we are getting rid of. The ricotta cheese recipe seems to be a hit and I wanted to share another recipe I made this week usuing our ricotta cheese. These are Ricotta Cheese and Blueberry Muffins. 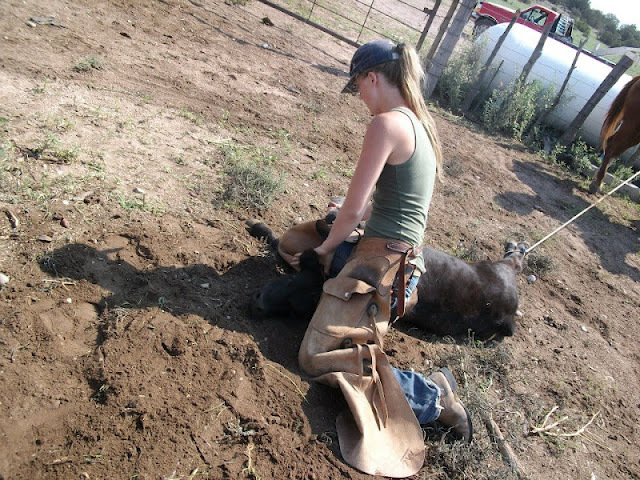 My oldest child has spent the last few weeks in Arizona learning how to brand from some cowboy cousins of mine. I sure miss her, but I am sure she will come home ready to take over the care of our calf. Here she is being all cow girl. I can't wait to get all of the stories...I am sure she will have lots to tell. Next week we will process all of the meat chickens and have a day for all of the buyers to pick them up. I also have some honey to sell that day. We just extracted a second harvest of honey and it has a very nutty flavor to it. I have never tasted anything like it before...it's good, but nutty. I have looked and researched and cannot figure out what nectar source will make honey nutty. Do any of you bee keepers out there know?